Omoi is a member of Team Samui and a shinobi from Village Hidden by Cloud. Later on he becomes the bodyguard to Fifth Raikage, Darui. 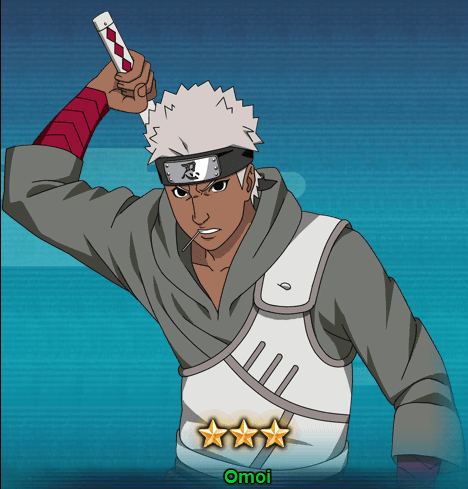 As for Naruto Online game, Omoi is a great addition to Lightning main team. Let’s take a look at Omoi abilities. Taijutsu Unique Style – Shield Cover [Prompt]: Generates Shield to 2 random Sowrd-User units on your team based on 20% of this unit’s base Resistance. It will also cancel all Debuffs on these ninjas will make them immuned to any Debuff unit the end of the round. Taijutsu Cloud Style – Back Slice: Attacks a random opponent;s unit and causes this unit to suffer from Tag, there are also high chances of causing this unit suffer Repulse. Taijutsu & Ninjutsu Cloud Style – Deception Slice: Chases and Attacks a Low Floated unit, causes High Float. After using this skill, your unit will get an Extra Standard Attack. Ninjutsu Unique Style – Sunbstitution Jutsu: High chances of evading Mystery Skill. Can be triggered once each round. Ninjutsu Shadow Clone Jutsu: At the beginning of battle, summon 2 Shadow Clones with attributes based in this unit. All shadow Clones are capable of using cloud style – Back Slice Attack. The main way to get Omoi is thorough Land Of Lightning Treasure. It will take 40-70 or 80-140 seal draws to get Omoi because it depends whether you get Samui or Omoi first. Other than the treasure, you can get Omoi when there is a Sage Treasure event. You can purchase Omoi ninja fragments using coupons.